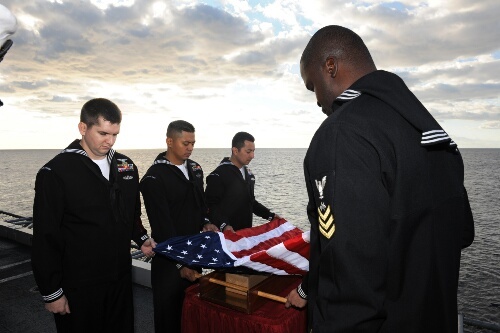 It takes place about 20 times each month: The casketed or cremated remains of an eligible individual are buried at sea. It’s an ancient tradition that’s probably been practiced as long as people have gone to sea, according to Naval History & Heritage Command. On Saturday, Oct. 22, crew members of the carrier Dwight D. Eisenhower carried on that tradition as the ship was training in the Atlantic. Ceremony procedures do not change. “All hands bury the dead” is passed over the ship’s intercom; the ship is stopped, if practicable; the colors are displayed at half-mast. The casket bearers, firing party and bugler are assembled. The formation is brought to attention, then parade rest. The chaplain then conducts the burial service, reflected in the above photo. The remains are then committed to the deep, and the firing party fires a three-volley salute. Those eligible include active-duty members of the military, retirees and veterans who were honorably discharged, U.S. civilian marine personnel of Military Sealift Command and dependent family members of each group. 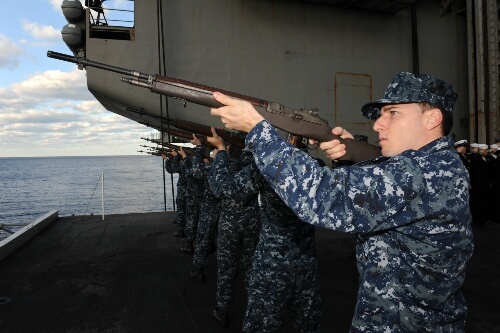 The committal ceremony is always performed on a deployed ship, so family members are not allowed to attend. How does one get permission for such burials? David, you simply apply after the death of an eligible individual. Here are all the details: http://www.public.navy.mil/bupers-npc/support/casualty/mortuary/Pages/BurialAtSea.aspx. There’s a phone number at the end for additional questions.